I have spoken in other occasions about planning the appropriate times to take pictures with the DSLWP-B Inory eye camera. In the beginning of October there was a window that allowed us to take images of the Moon and Earth. A lunar month after this we have new Moon again, so it is an appropriate time to take images with the camera. This time, the Moon will pass nearer to the centre of the image than on October, and at certain times the Earth will hide behind the Moon, as seen from the camera. This opens up the possibility for taking Earthrise pictures such as the famous image taken during the Apollo 8 mission. I have updated my camera planning Jupyter notebook to compute the appropriate moments to take images. The image below shows my usual camera field of view diagram. The vertical axis represents the angular distance in degrees between each object and the centre of the image (Assuming the camera is pointing perfectly away from the Sun. In real life we can have a couple degrees of offset). The red lines represent the limits of the camera field of view, which are measured between the centre and the nearest edge, and between the centre and one corner. Everything between these two lines will only appear if the camera rotation is adequate. Everything below the lower line is guaranteed to appear, regardless of rotation. We see that between November 6th and November 9th there are four times when the camera will be able to image the Earth and the Moon simultaneously. On the 6th it is almost guaranteed that the Earth will appear inside the image, and on the 9th it depends on the orientation of the camera. On the 7th and 8th it is guaranteed that the Earth will be in the image. To compute appropriate times for taking an Earthrise picture, I have made the graph below. This shows the angular distance between the Earth and the rim of the Moon. If the distance is negative, the Earth is hidden by the Moon. We see that the Earth hides behind the lunar disc on each of the four days mentioned above. In the figures below, we zoom in each of the events. In this level of zoom we can plot the “inner” and “outer” Earth rim, so we can see when the Earth is partially hidden by the Moon. On November 6th the situation is the most interesting in my opinion. It turns out the the Earth will not even hide completely between the Moon. In theory, a tiny sliver will remain visible. Also, it will take more time for the Earth to hide behind the Moon and then reappear. As we will see, the next days this will happen faster. Here, it takes 15 minutes for the Earth to hide, and another 15 minutes to reappear. It spends 10 minutes almost hidden. It can be a good idea to take a series of 10 images with an interval of 5 minutes between each image, and spanning from 12:40 UTC to 13:30 UTC, to get a good coverage for this event. On November 7th the Earth goes deeper into the lunar disc, taking 5 minutes to hide, spending 70 minutes hidden, and taking 10 minutes to reappear. On November 8th the Earth goes even deeper into the lunar disc. It takes around 7 minutes to hide, spends 105 minutes hidden and takes 10 minutes to reappear. On November 9th the configuration is quite similar to November 7th, but the hiding speed is slower. It takes 15 minutes to hide, spends 100 minutes hidden and takes 15 minutes to reappear. Overall, I think that the best would be to take a good series of images on November 6th, since this shallow occultation is a rarer event. The challenge will be perhaps to download all the images taken during these days. On average, I think we are downloading around 2 new images per 2 hour activation, taking into account repeats due to lost blocks and dead times. DSLWP-B is able to store 16 images onboard, and every time the UHF transmitter comes on, a new image is taken, overwriting an old image (more information in this post). Thus, if we take many images during these days, we have the danger of overwriting some when trying to download them over the next few days. Perhaps a good strategy is to arrange for a series of 10 images to be taken on the 6th, and then programming the UHF transmitter to take an image as the Earth comes out of its occultation on the 7th, 8th and 9th. In this way, the 2 hour periods of these three days can be used to download some of the images taken on the 6th, and there are still 3 images of margin in the buffer in case something goes wrong during the downloads over the next few days. 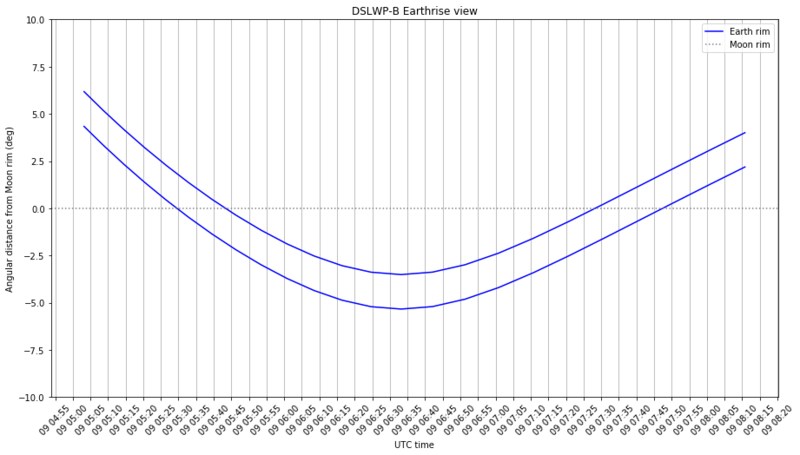 In my previous post I showed that during the DSLWP-B observation on 2018-10-27 17:20 UTC, the orbit of DSLWP-B would take it behind the Moon. This doesn’t happen every orbit (read as every day, since the orbit period is around 22 hours). It depends on the angle from which the orbit is viewed from Earth, and hence on the lunar phase. Knowing beforehand when DSLWP-B will hide behind the Moon allows to perform radio occultation studies. These consist in measuring the RF signal from DSLWP-B as it gets blocked by the lunar disc. Interesting phenomena such as diffraction can be observed. I have calculated the occultations that will be visible from the Dwingeloo radiotelescope in the remaining part of this year. 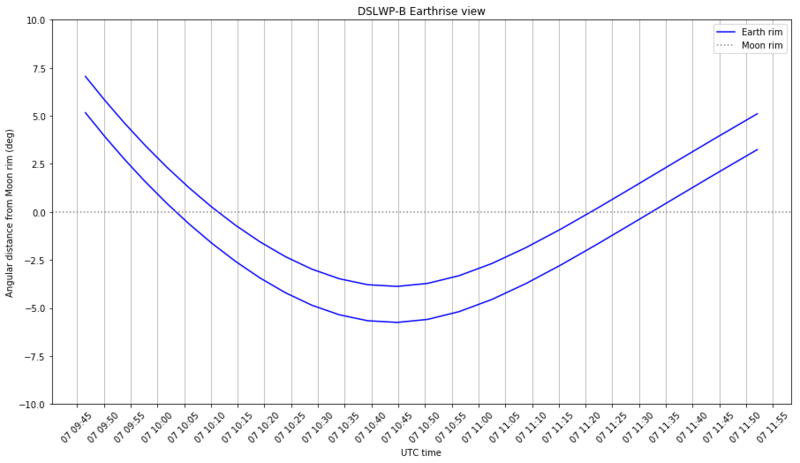 I have already spoken about the Moonbounce signal from DSLWP-B in several posts. 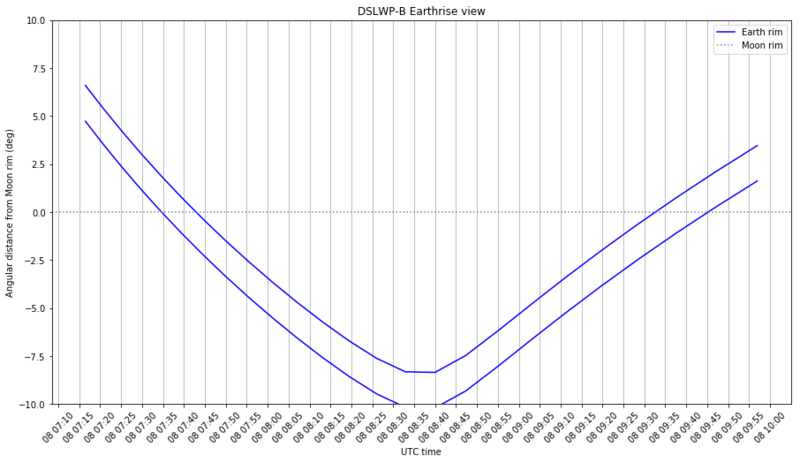 To sum up, DSLWP-B is a Chinese satellite that is orbiting the Moon since May 25. 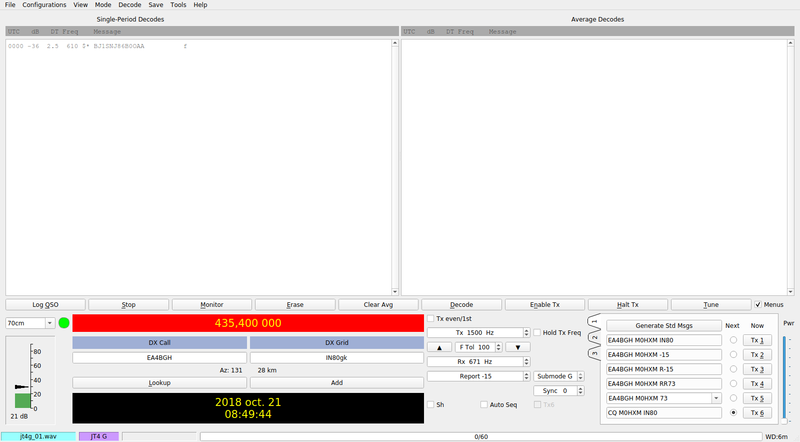 The satellite has an Amateur payload that transmits GMSK and JT4G telemetry in the 70cm Amateur satellite band. This signal can be received by well equipped groundstations on Earth, including the 25m radiotelescope at Dwingeloo, in the Netherlands (and also by much smaller stations). 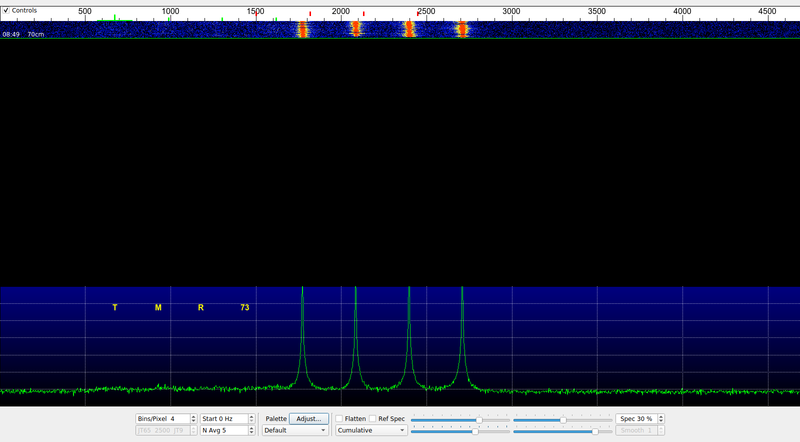 The people at Dwingeloo publish the recordings that they make of the RF signal. In two of these recordings, the signal from DSLWP-B is received not only via the direct path, but also through a reflection off the Moon’s surface. The reflected signal is around 25dB weaker, usually has a different Doppler shift, and has a Doppler spread of around 50 to 200Hz. 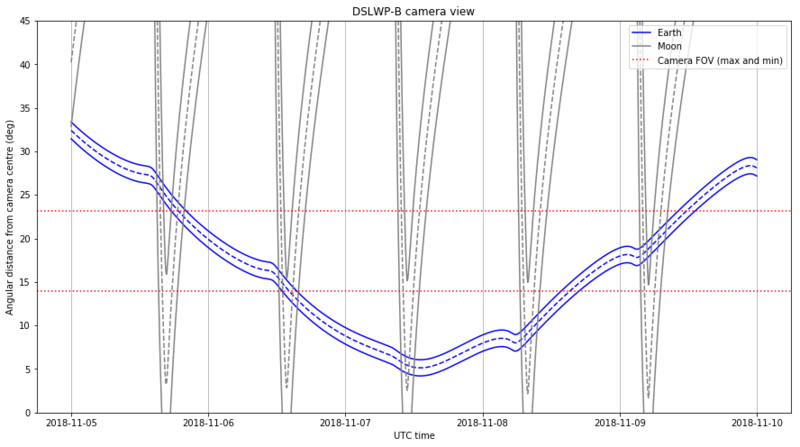 What I find most interesting about this is that of all the days that Dwingeloo has observed DSLWP-B, in only two of them (on 2018-10-07 and 2018-10-19) the Moonbounce signal has been visible. Mathematically, using a specular reflection on a sphere model, whenever the satellite is visible directly, there is also a ray from the spacecraft that reflects off the lunar surface and arrives at the groundstation (see the proof here). Therefore, I think that there must be something about the particular geometry of the days 7th and 19th that made the Moon reflections relatively stronger and hence detectable. Here I use GMAT to study the orbital geometry when the reflections were received. While writing my previous report, I had to keep track of when each of the images had been taken and when it was downloaded. This can be a bit tricky, since the images do not carry a timestamp. Here I describe the techniques that can bee used to identify and keep track of the images. 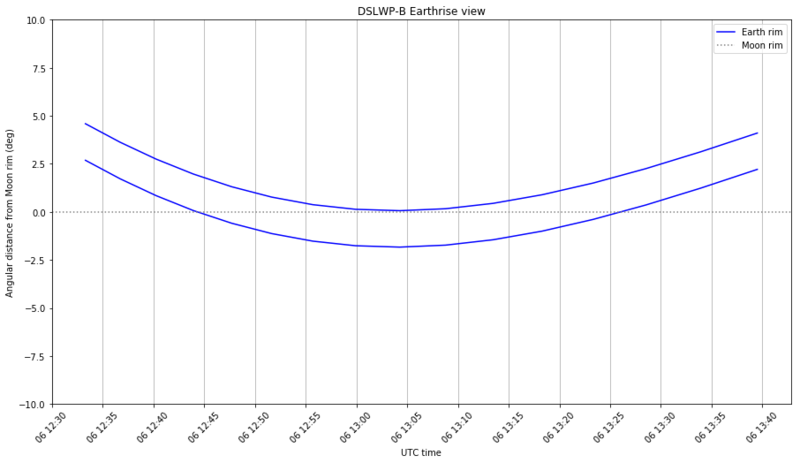 In one of my latest posts I commented on the Moonbounce signal of the Chinese lunar satellite DSLWP-B, as received in Dwingeloo. In the observation made in 2018-10-07 Cees Bassa discovered a signal in the waterfall of the Dwingeloo recordings that seemed to be a reflection off the Moon of DSLWP-B’s 70cm signal. My analysis showed that the Doppler of this signal was compatible with a specular reflection on the lunar surface. In this post I study the cross-correlation of the Moonbounce signal against the direct signal. This gives some information about how the radio signals behave when reflecting off the Moon. Essentially, we compute the Doppler spread and time delay of the Moonbounce channel. 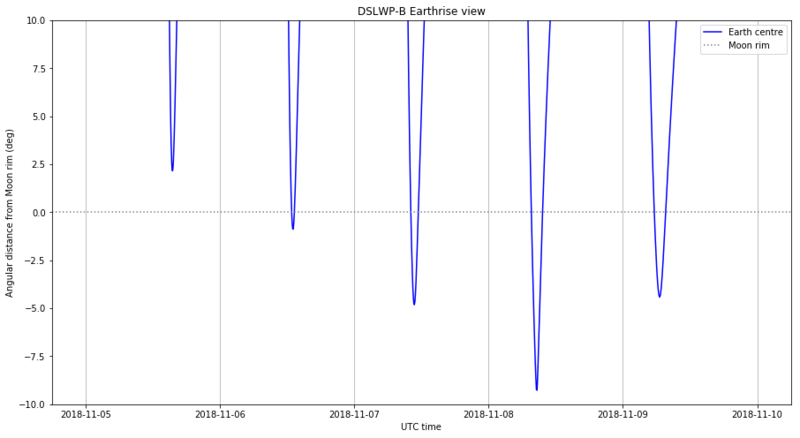 If you have been following my latest posts, you will know that a series of observations with the DSLWP-B Inory eye camera have been scheduled over the last few days to try to take and download images of the Moon and Earth (see my last post). In a future post I will do a chronicle of these observations. 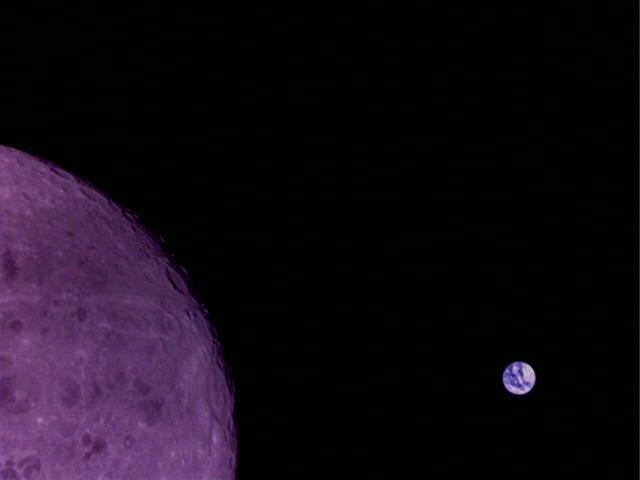 On October 6 an image of the Moon was taken to calibrate the exposure of the camera. This image was downlinked on the UTC morning of October 7. The download was commanded by Reinhard Kuehn DK5LA and received by the Dwingeloo radiotelescope. Cees Bassa observed that in the waterfalls of the recordings made in Dwingeloo a weak Doppler-shifted signal of the DSLWP-B GMSK signal could be seen. This signal was a reflection off the Moon. As far as I know, this is the first reported case of satellite-Moon-Earth (or SME) propagation, at least in Amateur radio. Here I do a Doppler analysis confirming that the signal is indeed reflected on the Moon surface and do some general remarks about the possibility of receiving the SME signal from DSLWP-B. Further analysis will be done in future posts.